Q: Can you delve a little more into the staff dynamic in the meetings? CS: That was an education for a young man who was only 25-27 years old. I consider these guys to be legends. I have already talked about Frank, how good he was as an assistant head coach, then there was Turner Gill and Ron Brown on the offensive staff. Does God make a finer man than those two? They‘re beautiful human beings, men of faith, they know the game, they’re charismatic. They oozed character. And I sat by those two every day and learned from them. I was actually under Ron’s tutelage coaching the tight ends. I got to spend a lot of time with him grading film and getting to know him. Tremendous position coaches who had interests outside of football. They were balanced. And because I worked with the tight ends I often got to work with the offensive line and Milt Tenopir and Dan Young a lot, too. Milt Tenopir, we kind of called him the ‘social chair’ of the coaching staff. He really had a gift. Ron Brown said it best in one of the morning Bible studies where he was talking about the gifts that they possessed, and Milt Tenopir really had a gift of making high school coaches and outside people feel warm and welcome in our program. He was really a social guy. A tremendous offensive line coach: there’s never been a finer one in college football. Tremendous technician, and again, game planning every week. I’m telling you what, Tom is brilliant, but a lot of that stuff? A lot of the ideas from the inside were Milt’s. I’m telling you, Milt could look at the grease board and really dissect a defense. In that interior box -the ball between your five or six against their seven or eight- how you could dissect and beat them? Milt was really good at that. Dan Young helped on offense, of course, and he did a great job of running our summer camps. The joke about Dan was that he recruited the best athletes on the team at punter. (laughs) Here we had one year, the #1 pick in the Major League draft was our kicker and punter, Darin Erstad! And then he’s got Bill Lafluer who can do a 360 degree dunk from the baseline on the basketball court. And then later on he recruits Kyle Larsen, who threw the shot put 60 feet in the State of Nebraska high school track meet. So Dan had a tremendous gift for spotting those athletes. Kris Brown in the NFL, Josh Brown, a skinny kid from Oklahoma who comes up. That’s the funny thing about that decade, we used to joke, “Even our kickers and punters were better athletes than other teams’ safeties.” I mean, the kickers and punter sometimes on Thursdays would have their touch football games, and they were more athletic than most teams’ secondaries! Just the great dynamic on the offensive staff, Tom was really involved with that. Tom was playing chess while everybody else was playing checkers. Tom was just always two or three steps ahead of everybody. All the conversations on the headphones, “If they do this we’ll do that.” He was just way ahead of the defensive coordinator. It wasn’t just better players, it was strategy. Especially on defense. You had some characters on defense. I just loved Charlie McBride and George Darlington. They were always getting after each other at the meetings. It was like two old wizards going after each other, it was comical. Charlie was just a classic. He was perfect for Nebraska football and encompassed what Nebraska football should be. He loved the kids; no one loved their kids more than Charlie McBride. He’d hug them around the neck, pray with them before the game, cry with them when they’d graduated. This guy loved his players and they loved him. There was a respect there. And George Darlington, he was just a classic. He was a good box guy up in the press box. George could come up with 40,000 different coverages, seriously. In fact, George’s brain sometimes would work too fast for what we were doing. He was such a genius on the board, he was almost ahead of the college coaches. Tom would have to rein him in, because the guy could X and O. He’d come up with more creative things on the greaseboard -and remember, Paul, we only had 20 hours per week to learn the stuff- so Tom had to rein him in now and then. Some different defensive end coaches? Tony Samuel was such a good technician and coach, he had so many guys go to the NFL. I remember working with Tony in a football camp once; I was amazed at how good a technician he was on using your hands, a good teacher. And after Tony we got a coach from the University of Texas, Nelson Barnes. He became a good friend of mine, a jovial guy. He did a really good job caring about the kids. The linebacker position? I got to experience both Kevin Steele and Craig Bohl. Kevin Steele, the old southern drawl and intense guy (you didn’t know how to take Kevin when you were a young guy). He’d kind of do the old coaching/hazing thing on the players when you were young, but he was a guy of faith, tough guy, great technician teaching linebackers. He left to take another spot and Craig Bohl took his place, and Craig was a former walk-on and native Nebraskan, and did a good job later on. I tell you what, Paul, what a staff. And here I was the youngest guy on the staff. And here’s Jon Bostick, my officemate, was the defensive GA. Jon was a few years older than I. Funny, Jon was a receiver when he played, but he was on the defensive side of the ball under George. And I have to say something about Jon. We’re good friends. Jon Bostick is one of the best coaches I’ve ever been around. If a Division 1 program handed me the keys tomorrow Jon Bostick and Ryan Held would be the first guys I would call. Jon, when I was coaching with him? I thought he was a fine coach, a good talent evaluator. What was cool, Paul, when we were assistants, they kind of let us run the walk-on program. I went full circle, because I got recruited as a walk-on, played as a walk-on, and now they’re giving us film and letting us pretty much evaluate potential walk-ons and giving them the thumbs up or the thumbs down. They let Jon and I take all the tapes and call the coaches. It was kind of our own little deal, they let us run with it. Dan Young was in charge, but the experience at talent evaluation was incredible. But like I said, Tom blended all those egos and all the coaching staff’s different personalities into one theme, and it worked. It just worked. Q: Any notable disagreements? Anybody get hot under the collar? CS: There was, like any staff or organization that’s competitive and exchanges ideas. Sure, there were some heated staff meetings. So many funny things happened. We’d spend so much time together. And I’d be remiss if I didn’t bring up the film guys: Brian Mohnsen, Bryan Carpenter, Dave Finn and those guys. They did such a great job. Then we eventually got HuskerVision, Jeff Schmall and those guys. MaryLyn was the secretary and then Joni; just the stability, the support staff, Director of Football Ops. Dave Gillespie, and then Al Papik and Chris Anderson and Curt Thompson and Pat Logsdon? We had a good strength staff, too. It was just a well-rounded, well-oiled machine for a decade. I saw a lot for ten years. Q: Let me ask you, Chad, what was it like making that transition from player to coach? CS: It was little tough that first year as a student-coach, because some of my peers were still playing; that caused some friction that first year. It was tough for them to view me as the coach, because Frank would give me drills to do as a coach. And I’ll never forget this, a little story: you know the coaches would go out recruiting some Thursdays and Fridays in the fall and we’d have practice with Tom and a few assistants there. Well, one time Frank went back to New Jersey to recruit some guys and he gave me a list of drills to give these guys. And you know, they’re banged up and sore -I knew what that was like- and they were grumbling. But Frank gave them to me to do them, and someone said, “Shut up! Chad’s going to be the coach today and we’re going to do the drills.” And do you know who it was? It was Lawrence Phillips. It just shut everybody up and they went through the drills. And I’ve never forgotten that. And of all the issues and trouble and different things that Lawrence experienced in his life, until that one incident he was a tremendous practice player. He was a warrior. Another quick Lawrence story: the year I blew my knee they were having a little bit of hazing and stuff in the locker room. They were doing some stuff and I had my crutches, but that didn’t stop them. They’d get you in the shower and grab you and haze you pretty good. It wasn’t bad -not that bad – but they were gonna grab my crutches and take hold of me, and Lawrence stood there and said, “No one’s touching him.” And that was the end of it, nobody grabbed me or anything. I’ll never forget that. He put a stop to it. That’s the Lawrence I remember. He was a warrior and a good teammate, he really was. But getting back to your question: it was a hard transition, but after that you’ve created a little bit of separation as you started getting older than some of the guys (because the guys you played with were gone), then the players started respecting you. And by the time I was 27 years old there? By the time I left you had a lot of respect from the players and you were kind of a veteran then. Q: You were one of the wise, old geezers by then? Q: Do you remember the first game you played in? CS: Yeah, I do: it was against UCLA. It was a nationally televised game and at home there, and we just drilled them. We really drilled them. 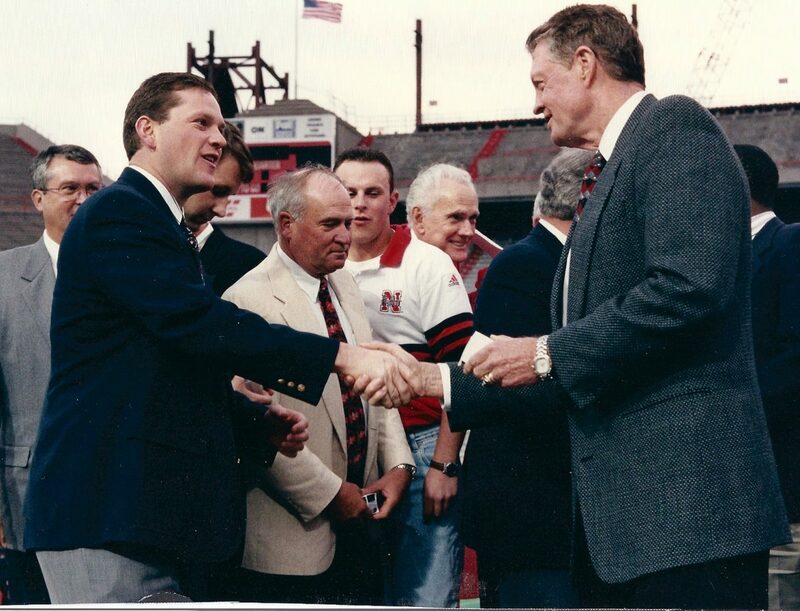 It was one of those games where at the end everyone’s trying to stand around Coach Osborne to get in. And we go in and call a play, and Brook was in with me. We got into the game at the same time, so that was kind of cool. And I got to carry the ball against UCLA: it was a fullback dive and I got maybe 3 yards. So it was really cool to be out there and gain some game time. 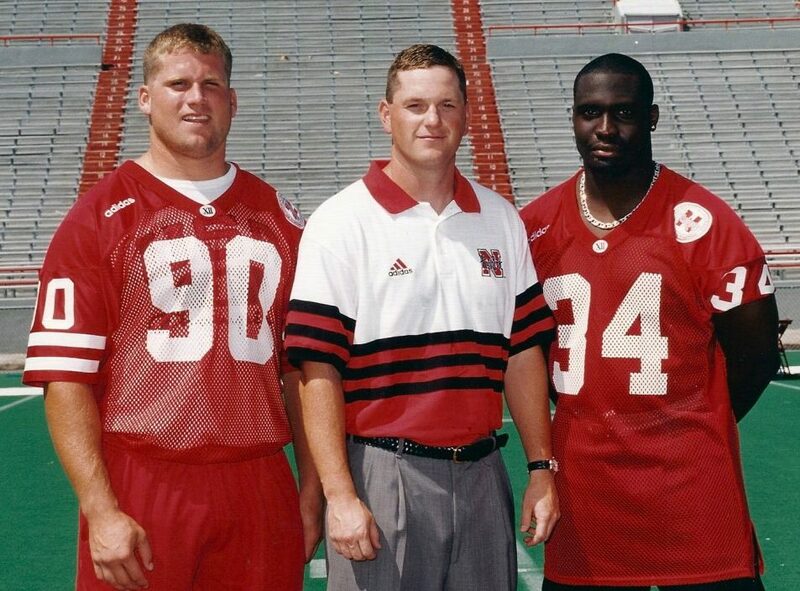 And that was another positive about being in a program like Nebraska, because even if you were young and not first or second on the depth chart, you knew you were going to play in the games. Because we were thumping people so bad everybody got to play. That was a bonus then, too. And you know, one of the things about the coaching: I’ll never forget ’97, the year Tom announced when was gonna retire, the extra effort that staff put in to win that title for him. I’ll never forget that. We worked a little longer, we worked a little later. Not that every T wasn’t crossed and every I dotted than before, but it was extra effort to get Tom that title. Q: Was that a yearlong effort, or just the title game there? CS: I think once he announced it there in November. It actually came as a shock. Once he announced it there were a few games there. And the Tennessee game? There was just a tremendous effort from that staff to win it for Tom. And it took a lot of that to win it for Tom, because it took a lot of that from the players and coaches. The ’97 team was very good, don’t get me wrong, but not as dominant as the other ones. We got that lucky bounce-kicked ball against Missouri- there were things that were divine, no doubt about it. And I’ll never forget the transition from Tom to Frank. I picked up Frank Solich at the airport when he was gonna be named head coach. Tom had announced it, and I’ll never forget picking Frank up. I said, ‘Are you ready for this?’ And he said, “I’m gonna need all your help.” (laughs) We knew the task of, the weight going onto a guy following a legend. Obviously, the knowledge was there, the experience, but to get the keys turned over to you there? That was quite a big deal. 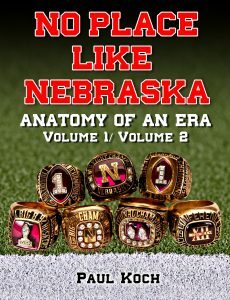 And the expectations at Nebraska are second to none. Just the transition was interesting. Q: Was there some staff grumbling, a schism? CS: I think everyone all along thought it was gonna be Frank just because Frank had been named Assistant Head Coach before. I think Frank went after that K-State job but Bill Snyder got it, went after the Kansas job, the Minnesota job. He was being sought after in college football, no doubt about it, and everyone on the staff thought he was the natural next guy. Among the fan base you always heard if it should be this guy or that guy. There’s no right answer when you follow Tom. There were so many good choices after that, you could have named about anybody. It was an interesting transition, and then in the end the new administration thought it wasn’t good enough. That’s too bad, I guess 80% is not good enough. Q: As a player, do you have a most memorable game? CS: I didn’t play in it, but my favorite has to be Tom winning his first title there down in Miami. That was really the last game I was a player. I didn’t get to play in that game, but it was my last as a player. All the hard work, all those years, all those close calls for Tom, back in ’84 against the Canes and all that, the out of bounds stuff with Penn State in ’82, and with Oklahoma, getting so close so many times. The year before with Florida State. It was just like a big weight lifted off the program. It finally happened, and to be the team there with a stadium half full of Husker fans down in the Orange Bowl? Half the fans were Nebraskans. And I still remember to this day, the people grabbing grass off the field as mementos. It wasn’t even like it was a game, but more like a battlefield, and all the honor that goes with that. And the locker room afterward? Just the release that was going on there. And there were some other ones there, Paul, that some people probably forget about, but we had some of the first night games ever on ESPN in ’92. If you remember, back-to-back Saturdays we had KU and Colorado. And that stadium literally shook on those night games because, of course, the students and fans had all day to get lubed up. I’ll just never forget those two night games in ’92 when we started to really become a Top 3 power. Not just a Top 20 power, but a national power. When we scored 50 points on these two top-rated teams, I’ll just never forget the stadium and how it actually shook. Q: Was one of those night games versus Colorado, was it snowing or something? 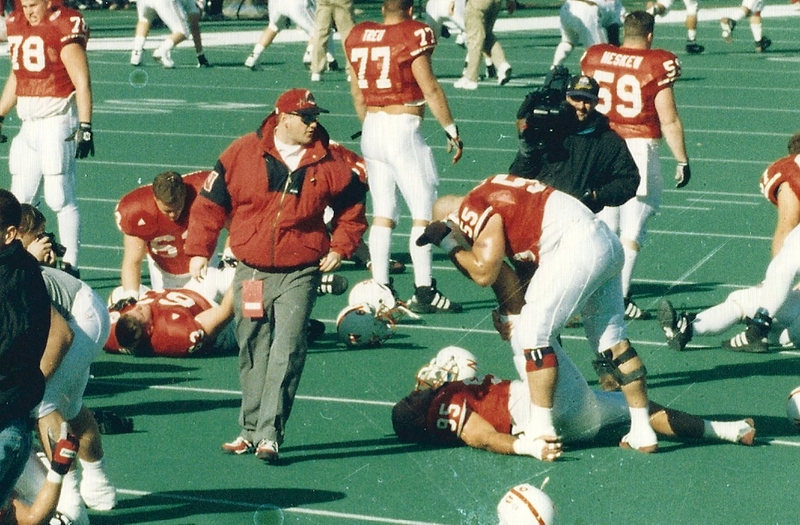 CS: It was pretty cold, and if you remember earlier in the game Trev Alberts had a safety and Travis Hill picked one off for an interception for a touchdown, they were just hammering Koy Detmer. That’s back when Nebraska/Colorado was a pretty heated thing back then. It wasn’t a respect rivalry like Oklahoma/Nebraska. It was kind of chippy back then, (laughs) there wasn’t a lot of ‘like’ between the two programs back then. Q: And speaking of that Miami game again, any other things stand out to you being on that sideline, pregame, postgame? CS: Well, I probably have the same recollection a lot of the fans do, in that I was absolutely shocked that these south Florida athletes and that heat like they were used to, they were on their knees sucking gas in the 4th quarter. We all remember Warren Sapp on his knees sucking air. Warren Sapp had an awesome first half, and then Brenden Stai and those guys trapping him -even though they were well conditioned and great athletes- but we’d never been down in that heat. CS: Yeah, and just the feeling on the sideline as it’s transpiring, realizing that we’re finally gonna get this done, after all those close calls, like the year before against Florida State: we kind of had a miracle drive to get it down there but Byron’s field goal was just wide. And knowing they were to run out of gas? But how vintage was it to beat them with a fullback play and Cory Schlesinger? Now that’s Nebraska football. It wasn’t a 4-wide post pattern, it wasn’t even an option play, it was a fullback trap! And that statement was Tom Osborne-football there. Q: With Matt Shaw and Abdul Muhammad throwing the biggest blocks of their lives on that play? CS: Yeah, and how about Ron Brown’s Mighty Mites out there that decade? Unselfish guys that were feared. We’d go into the stadium and the secondary would just fear these little ninjas out there. They were like assassins. Seriously! They wanted people-knockdowns! You’d hear Ron Brown talk about knockdowns; they’d go for 10 a game, that was just unheard of! I remember seeing some All-Big 12 safeties -I remember one from KU- he was just laughing at our sideline. It wasn’t a mocking laugh, it was a funny laugh like, “You guys are just killing me.” It was almost to the point where he asked us to call off the dogs. And another thing: against Tennessee in that national championship game in ’97? I remember Leonard Little, their All-American linebacker, I remember him actually walking over to Charlie McBride in the 4th quarter and he said, “Call off the dogs, Coach. Call off the dogs,” I’ll never forget that. Tennessee had had enough. I saw him say it. Q: And as a coach, any most favorite game? CS: It was cool once I got to be a GA because I got to go up to the box. Then I was in charge of the drawing and had to get the cards to Coach Osborne or Coach Solich. It was neat to see, especially when we got to see the development of a young, eventual Heisman Trophy winner: a young Eric Crouch. He was just coming onto the scene in my last years there. It was neat to watch from the box, the defensive alignment, because you knew the way they’d line up sometimes. You’d say in the headphones, ‘This is gonna be touchdown.’ And it would be. It was amazing. From that high up you could tell the alignment and the way they were going to block it, you just knew. It was neat being up there and being with Milt and those guys and see a play and see what we’d work on in practice, and you knew Eric was gonna score. You knew they didn’t have enough people for the angles to catch him, the way our set was lined up. One play I’ll never forget was at Iowa. 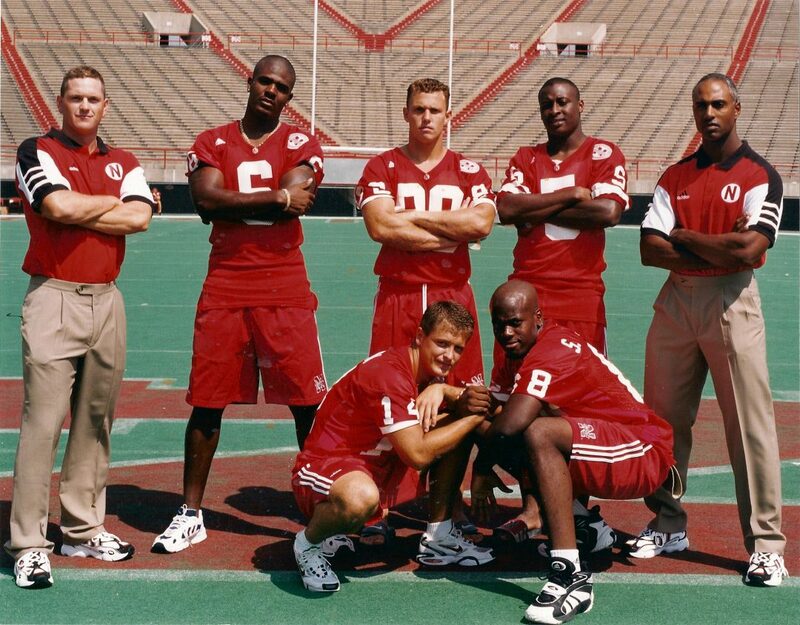 Remember that year Eric Crouch ran over their safety at the goal line? That was a super-hot day. Their press box facilities aren’t very good and we’re all crowded into one on like the 10-yard line. And we had some bigger coaches, so it was pretty full-on sweating on that day, we were just crammed in there. But Eric running over that safety was a good one. It was a great time. Q: Any memorable practice occasions? CS: I got one for you, this could be practice –slash- summer camp story. You probably remember… in fact, we had a little nickname for Coach Osborne. We called him “Charlton Heston-Moses” behind his back. He wasn’t afraid of lightning. I remember Ron Brown telling me, “Now, you watch out for Coach. He’s not afraid of lightning. He’ll just keep on rolling.” I remember one time (and you might remember this practice, Paul), stretching and whatever, there was a squall line of thunderstorms came into Lincoln there. And of course, Moose and Carp, the video guys, were up on this big lift getting ready to film practice, and we’d heard of this severe thunderstorm warning for Lancaster County. And Tom was like, “Nah, let’s keep going.” And I’m not kidding you, Paul, there must have been a straight line of wind hit at about 70 miles per hour and lightning is just hitting everywhere around those big light poles… and of course Tom wants to keep practicing, keep going! Eventually some of the assistants and some of the players start making their way toward the locker room. (laughs) It was like being on top of a mountain, with lightning crashing everywhere. Those guys up on these lifts? I was like, ‘My gosh, either they’re gonna get blown over or struck by lighting.’ Lightning didn’t scare Coach Osborne.